Quality Silver Jewelry from the Southwestern United States is unique and a historical heritage of North America. Quality Western Silver Jewelry is world renown for being some of the most unique Silver Jewelry in the world. There is a big difference between quality western silver jewelry, fashion silver jewelry and costume Jewelry. Quality Silver Jewelry is authentic handcrafted Silver Jewelry made with authentic Silver and natural (real) gemstones. Quality Silver Jewelry has been made in the Southwestern United States since the late 1800's and became a major industry fuelled by the development of the Western United States. Durango Silver Company was founded in the early 1970' by John and Estell Hartman, who were among the many individuals producing high quality Silver Jewelry, quality Southwestern Silver Jewelry as well as Silver Jewelry with Turquoise in Albuquerque, New Mexico. John and Estell had a stone cutting shop and a Silver Jewelry Manufacturing shop that produced some of the most unique Silver Jewelry coming out of Albuquerque at that time. John and Estell moved from Albuquerque to Durango in 1974 and continued producing quality Silver Jewelry for the American Jewelry market. In 1976, John built the log structure that became a historical monument just west of Durango on Hwy 160 which is the gateway to Mesa Verde National Park. Today, Durango Silver Company has become a family owned business that produces some of the finest authentic Southwestern Silver Jewelry and Silver Turquoise Jewelry coming out of the Southwest. 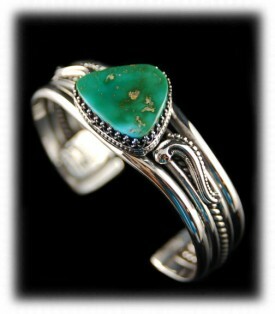 Durango Silver Company specializes in high quality authentic American Turquoise set in Sterling Silver Jewelry. The entire Hartman family is now involved in producing the highest quality Silver Jewelry possible and they market it in the Durango Silver Company Trading Post as well as on their family run website located at www.DurangoSilver.com. 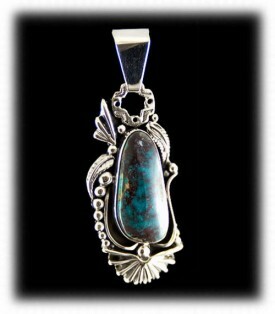 Durango Silver Company are purveyors of one of the finest high quality authentic American Turquoise accumulations in the world. We cut our own gemstones, control and manage how the highgrade Turquoise stones are used and market the finished Silver Jewelry and Silver Turquoise Jewelry that is produce by our company. To the left is a beautiful Silver Ring made by Crystal Hartman that was made with the lost wax method. Crystal sculpted a wax carving around a Broken Arrow Turquoise gemstone that was hand cut by John Hartman. Crystal spent hours designing the wax pattern to perfection and than casted the wax master into Sterling Silver in the lost wax method. This is a fabulous quality Mens Sterling Silver Ring that was made for one person only! It is a one-of-a-kind piece of art. To the right is a quality Silver Bracelet that was Navajo handcrafted by Patrick Yazzie. This great bracelet was made with many Sleeping Beauty Turquoise stones and excellent quality silversmith craftsmanship, this is called a Navajo cluster row bracelet and Patrick has made many of the same type, but, each one is a little different as they are handmade one of a kind pieces. We have a lot of quality Sleeping Beauty Turquoise Jewelry items and we also have a nice presentation page on Sleeping Beauty Turquoise Jewelry that you will find factual and interesting. 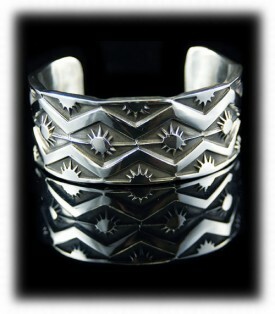 This Silver Bracelet is most certainly considered quality Southwestern Silver Jewelry. To the left is a pair of Zuni Needlepoint Hoop Earrings made in Sterling Silver with authentic Sleeping Beauty Turquoise from Arizona. There are a lot of production Zuni Turquoise Earrings, however, Durango Silver Company only handles the finest quality Zuni Silver Jewelry and Silver Turquoise Earrings are one of our specialties. It costs only a fraction more to get authentic, high quality, Southwestern Silver Jewelry and we highly suggest you buy your Zuni Silver Jewelry from a reputable dealer and get that high quality Zuni Silver Jewelry that will become a heirloom to be passed down though generations of your family once you are done enjoying you fine piece of Western American Heritage. 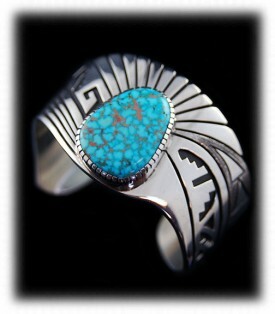 We have a great presentation page on Arizona Turquoise that is detailed and and fun to look at. To the right is a beautiful piece of Sterling Silver Jewelry made by John Hartman of Durango Silver Company in Durango, Colorado USA. This Western Silver Bracelet is a classic Southwestern Turquoise Bracelet made with Royston Turquoise which is one of the most famous Turquoise Mines in Nevada. It was made You can visit the Royston Turquoise Mine and even take a tour to collect your own high quality Royston Turquoise - visit our Royston Turquoise Website to find out more. Durango Silver Company handles and produces some of the finest quality Silver Jewelry and Silver Turquoise Jewelry coming out of the Southwestern United States today. Our quality Western Silver Jewelry will be priceless heirlooms from the American West as soon as you buy them. To the left is a gorgeous Silver Bracelet that was Navajo Handcrafted by Native American artist Alton Bedonie. The Silver work on this bracelet is very high quality and has intense time consuming work - it was made by cutting out the designs on a top layer of Sterling Silver and then overlaying it onto a back plate of Silver sheet. 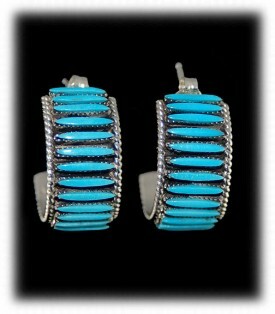 This is quality Navajo Silver Jewelry that will be historic American heirlooms of tomorrow! This is a great piece of Southwestern Silver Jewelry which has a wonderful spider webbed Turquoise gemstone from the Kingman Turquoise Mine, one of the very first Turquoise Mines discovered by ancient Indians of North America over 2000 years ago. To the right is a masterpiece in quality Silver Jewelry by John Hartman of Durango, Colorado. This Silver Bracelet has handcrafted Silver designs that are not seen in anyone else's Silver work worldwide and John is quickly becoming recognized worldwide by museums and collectors as being one of Americas most noted Silversmiths from this age. The Turquoise used in this Silver Bracelet comes from Johns son Dillon Hartman's Tortoise Turquoise Mine which is located near Mina, Nevada. John and Dillon mine the Turquoise once a year and cart it home to cut it into cabochons to be set in high quality Silver Jewelry. Tortoise Turquoise is rarely seen for sale as Dillon hoards the stone which he will use in his quality Silver Jewelry for the rest of his life. 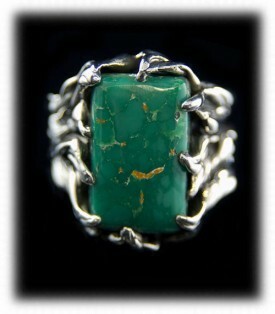 Visit Dillon's Tortoise Turquoise website to read more about this fine Nevada green Turquoise. To the left is a pair of quality Navajo Silver Earrings made with Sleeping Beauty Turquoise, Spiny Oyster Shell and Sugilite gemstones. Durango Silver Company specializes in producing quality Silver Earrings as well as many other Silver Jewelry items. 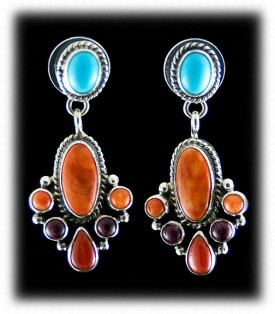 This pair of Silver Earrings are considered to be of the Navajo cluster style and have a vintage Silver Jewelry flavour. They are most differently of Southwestern Silver Jewelry style and are unique, fancy and highly collectible by many quality Silver Jewelry collectors throughout the Southwest as well as the rest of the world. Navajo Silver Jewelry is an American heritage that should be shared and appreciated by all Americans - it is a craft that is ever changing and the quality designs of today will live on to be important Antique Silver Jewelry in the years to come. To the right is an outstanding quality Silver Mens Ring that represents the fine quality Silver Jewelry being made by Durango Silver Company. 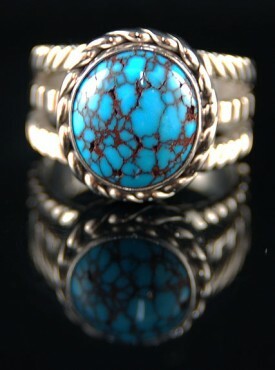 This Mens Turquoise Ring has a spectacular Turquoise Stone from the Lookout Mountain Turquoise Mine located in Nevada. It has very rare red spiderwebbing in a sea of sky blue Turquoise. The Spiderweb Turquoise Stone is embellished by exquisite Silverwork by John Hartman of Durango Silver Company. Uniquely stamped and tooled, this piece of quality Silver Jewelry will become a valuable piece of Vintage Turquoise Jewelry in the future. This type of Silver Jewelry is highly collected by investors and collectors from around the world. To the left is a piece Quality Silver Jewelry handcrafted by a Navajo Native American Artisan from the great Southwest. Ben Lee hand stamped this marvelous Silver Bracelet with geometric designs that are breath taking when you see it in person. Quality Silver Jewelry made by Navajo Indian Jewelers is prevalent in the Southwest and collected by individuals worldwide. 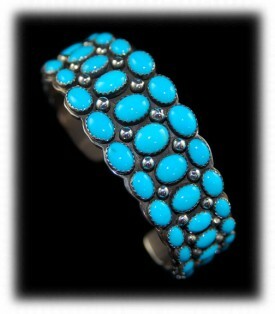 Durango Silver Company salutes the Navajo Silversmiths and handles much of their fine quality Silver Jewelry. We invite you to browse through our online store to see and enjoy many fine quality Navajo Silver Jewelry items that we have on hand now and hope you will join our Newsletter to get in on our monthly Silver Jewelry Awards Giveaway as well as the special deals we give our members only. To the upper right is a Sugilite Necklace made by John Hartman of Durango Silver Company with an outstanding Sugilite Gemstone hand cut by Dillon Hartman. This is an fantastic piece of quality Silver Jewelry with a Southwestern Victorian flavour that John has become famous for. His style of Silver Jewelry is remarkable and is now being sought after by many important Jewelry collectors globally. Johns Silver Jewelry is of a quality that is unique to itself and his pieces are one of a kind which make them so very special. You can read more about John Hartman on our presentation page on him. 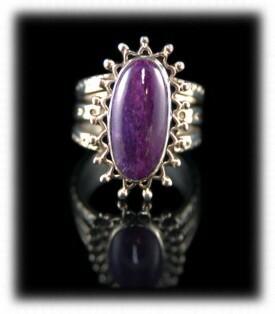 To the left is a beautiful quality Sugilite Silver Ring made by John Hartman of Durango Silver Company. 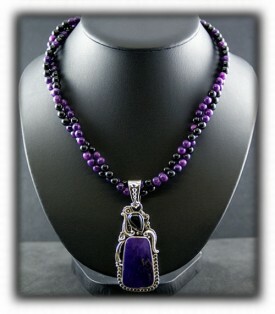 Sugilite Silver Jewelry is fairly hard to come by as they had to stop mining it in Africa due to term oil and violence. 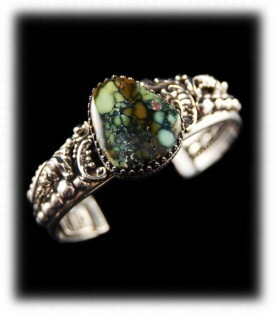 This is an intricate Rings made in Sterling Silver and is as most of Johns Silver Jewelry - one of a kind! Also visit our Silver Jewelry and our Silver Jewelry videos pages. We hope you have gained some useful knowledge from our Quality Silver Jewelry educational presentation page. We invite you to learn more about Silver Jewelry, Indian Jewelry and Turquoise Jewelry by following the links in our Learning Center which has many other informational pages that we have written on topics related to Southwestern Silver Jewelry. In addition, we would like to invite you to join our E-Mail Newsletter - about once every other month we send out a Newsletter to inform our members of what's happening with Durango Silver Company, new products, specials for our members and more. We also have a monthly drawing from our members to Giveaway free Turquoise Jewelry from our company. Please take a moment to become one of our friends and future winners in our giveaway by signing in below. Thank you for reading our presentation on quality silver jewelry.